Leysia Palen is Professor of Computer Science, and Professor and Founding Chair of the newly established Department of Information Science at the University of Colorado Boulder. 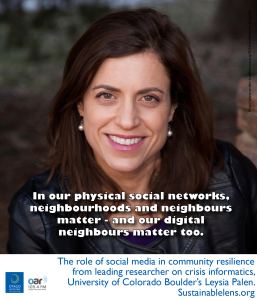 We talk of crisis informatics and the transformational role that social computing can play in the way society responds to mass emergencies and disasters. Default settings on calendars…culture of environment in which technology is created in gets baked into technology itself…colonising values to different places. We adapt to the events that are happening – what are the salient problems for which research will have something useful to say? Finding it can be difficult, but those who need it, they find it and do something with it – they’re persistent because they need it. But when people are in hugely stressful situations they’re not able to manage the information, then we get people on the outside who want to help, and curate information – increasing the signal of the good information. A research focus is how do we amplify the signal? The practices around outgoing messaging are becoming very good, but listening strategy…they’re not listening. Social media is a stage upon which people are acting, it’s a place of convergence. So even though we can see the jokes, the dark humour and the sensational stuff, but underneath that is really important work being done. We need to pay attention to practice – how people actually do things. Things happen in situations, and our technology has to be able to adapt to that. People want to do more than digital prayers and clicking for donations – but they want to do more. (what can we learn from crisis to the longer, slow burn crisis?) Hurricanes, wildfire and so on are going to become more violent, more frequent…how do we communicate risk? how do we understand risk to our planet, to our children and grandchildren. How do we understand risk so that we can change our behaviour? It’s about communicating risk but it is also about communicating solutions to different populations. (Activist?) I am an activist, I’m an activist of knowledge, of reality, of sober and sombre understandings of our relationship with our technological world, and each other, and I am sympathetic to the problems that we face. As a researcher I try not to bring any presumptions into the questions that I bring there but to bring a critical eye to bore through the rhetoric of things like disaster which are politically charged. I pursue the truth – sounds pretty trite I know – and I try to communicate that. I feel very strongly about finding the right words and communicating that for different audiences, so in that way I am an activist. (Motivation?) I want to know, I want others to know, I want us to be concious and conscientious. (Challenges?) We’ve been working in Crisis Informatics for 10 years, we’ve made a lot of inroads with students being able to take on more complex problems – I want to get beyond dismantling the myths and work even deeper on the problems. As new chair of department I want to create a curriculum for our undergraduate students and have them be able to address a range of societal problems as well as commercial challenges, but in this way that deals with data in ethical, mathematically responsible, ethnographically responsible ways. (Miracle?) That my children and all of our children wouldn’t have to worry about disasters and the effects of climate change. And that if they do worry, which they will, that we’ve left them the tools – intellectual and built – to mitigate whatever it is that we’ve given them. (Advice?) Be attentive. Don’t presume. Be watchful for how technology is driving us in particular directions, but also don’t be over-cautious about that either.